When God offers a second chance, will these Amish women seize it? 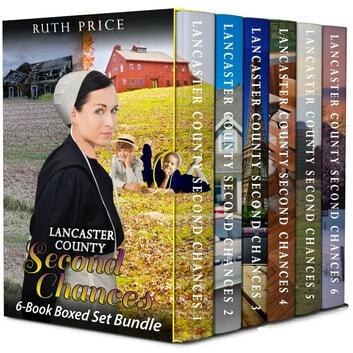 The Lancaster County Second Chances 6-Book boxed set is a best-selling, complete Christian romance collection that will make you fall in love with an entire Amish community. >>> BOOK 1: An Amish widow. A second chance. Can love rise from the ashes? After Katie Fisher's husband and young son are killed in a fire, the Amish widow returns to her parents' home with her faith in shambles. But when 31-year-old Amish widower, Joseph Lapp, comes to Katie's district church service looking for help with his three rambunctious children, Katie accepts the position. She quickly finds herself falling in love with Joseph's children, and Joseph himself. But when a new tragedy threatens their fragile future, will the couple have the faith to risk a second chance at love? >>> BOOK 2: The prodigal daughter returns. But can she face her past? Everything is threatened when Joseph’s younger sister, Cora, takes refuge in his home. Disowned by their parents, Cora is all out of options and hiding a terrible secret. Can Cora escape her past, or will she find the strength in God to face it? And what will Cora's decision mean for Katie and Joseph? >>> BOOK 3: Abused. Betrayed. She survived, but now that she’s found love, is it enough? Amish teen, Cora Lapp has survived abuse and betrayal to return to her Amish home, but she struggles to decide if love is enough to make her content as an Amish woman. >>> BOOK 4: A romance. A child. A journey. One mistake could destroy it all. A simple mistake has heart wrenching consequences. >>> BOOK 5: A crossroads. Judgment. Will they be Shunned? Best friends Cora and Mary may lose everything. >>> BOOK 6: Joyful news. A terrible risk. Can love conquer fear? When Cora gets very special news, will fear force the love of her life take a terrifying risk? 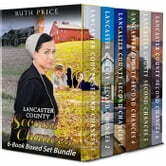 The Lancaster County Second Chances 6-Book boxed set is a complete series collection that that blends God's Word with the Amish lifestyle. If you are looking for a beautifully written, clean story that grabs your interest and holds it, then you'll love Ruth Price's series of faith, love, and sweet romance. SCROLL UP & GRAB THESE SIX BOOKS -- 831 Pages -- AT 45% OFF TODAY! Second Chances were very well written. The characters were well chosen for their parts. The writer kept you wondering how it would turn out But in the end you knew it had too. I would recommend this book to anyone who enjoys a romance with christian valves. A well written series, to start the family and then include others to the mix, I found it very hard to put down. Thank you for an enjoyable read.